Contains soluble salts, mostly chlorides and sulphates of sodium, calcium and magnesium in quantities sufficient to interfere with the physiological activities of most crop plants. The soil PH of saturation extract is 8.5 , Ec > 4 ds/m , ESP> 15. 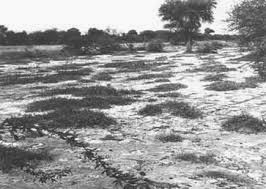 Saline sodic soil is a soil with sufficient exchangeable sodium to interfere with the growth of most crops plants and containing appreciable quantities of soluble salts. Alkali soils contain salt dominated by bicarbonates or have sufficient exchangeable sodium to interfere with physiological activities of most crop. The PH of alkali soils is > 8.5 Ec > 4 ds/m and ESP>15. Usar, Kallar, Kari, Chopan, Bari, Reh, Choudv, Kshar and Fougu.